Guzman Y Gomez’s agile approach to marketing and its strong growth trajectory has seen the brand chalk up a significant social media win, trial Google drones food delivery and now invest in its biggest out-of-home campaign ever. The fast food brand’s CMO, Lara Thom, told CMO the execution of its award-winning campaign, #bringcalhome, stemmed from the brand’s clear purpose and voice, as well as a robust social media-led approach to customer engagement. It’s now earnt the brand Best Marketing Campaign at the recent QSR Media Awards. 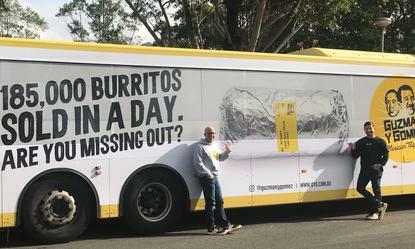 The campaign was based around millennial consumer, Cal Ryan, a Brisbane-born customer who posted a message to the brand’s Facebook page while travelling in London to say he hadn’t eaten a GYG burrito bowl in six months and asking whether he could be flown home to enjoy one. Quick off the mark, the GYG team gave Cal three weeks to get 3000 comments and 1000 shares of his post to secure his flight home. The timing in November coincided with the opening of the brand’s 100th store in Burleigh, Queensland. Within 24 hours, Cal, a former radio station employee, had met the social targets and guaranteed his trip home. In addition, by doing a bit of social researching and engagement, GYG had discovered Cal’s older brother was also away from home, and he’d also become an uncle. So the team also flew his sibling home, orchestrating a surprise family reunion as well as Cal’s appearance at its Burleigh Heads restaurant launch. “Everyone loved the story, as it evolved organically,” Thom said. “It made people feel good. With so many horrible things happening in the world, it was a nice distraction. For GYG, the results included organic reach of nearly 1.2 million people, more than 42,600 social media interactions, and PR value of "a bazillon dollars", according to Thom's team. The campaign's earned media reach was also significant, with the story scoring airtime on the Today Show and US news programs. Thom joined GYG 18 months ago and promptly stopped traditional media spend, putting the emphasis on mobile and social media monitoring and engagement. But with GYG having reached critical mass with 106 restaurants, she’s just kicked off the brand’s largest ever out-of-home and media campaign with messaging across 400 buses nationally. Out-of-home is a major piece in the $1 million 'Food stories' campaign,which focuses on telling the stories and big numbers behind the brand's food. It's being supported by radio and social media advertising and launched in market in May. For example, one message focuses on the fact that GYG now sells 185,000 burritos every day and asks consumers if they’re missing out. For Thom, the messagingtaps into the age-old consumer fear of missing out. “Out-of-home is a great awareness piece as long as you have the message right,” she said. “Too many marketing managers just translate their TV or print ad onto an outdoor panel or piece of media and it has so little impact. You have to be quite strategic about your messaging. There are hits and misses, and I think we’ve had a real hit with this latest campaign. “Through social, we reach 3 million people per month and that’s what drives our business. But you still have to complement it, and we see the outdoor campaign as very strategic and purposeful. I don’t include it in the media mix unless we have a certain message to tell that we think is appropriate for the media itself. "Food stories... continues today and has been enormously successful for GYG because it wasn't expected and we don't create noise in the marketplace unless it's very strategic." Driving all of this is a very clear brand vision and values, Thom said, factors which stem from company founder, Steven Marks. GYG is now looking to raise up to $35 million to take its brand into the US market. “There is something beautiful about walking into a brand and not having to redefine it. We know when someone walks into the business immediately if they’re GYG material or not,” Thom commented. “From when I walked in, my task was easy: It was ensuring we had a focus. For example, focusing on digital as a channel and making sure nailed that. More recently, it’s been about menu innovation. We launched fries, which was a big change for Mexican, because Mexican chains are not typically known for fries. But it was a piece that was needed to move into our drive-through strategy. And Mexican people do eat fries. Thom said GYG has also resisted the trends of discounting, bundling or supersizing in fast food and introduced its ‘minis’ range. The next evolution is plant-based products. Again, Thom described her role as helping to “blow these things up”. “That’s come from a place of saying yes and not being indecisive, we’re a brand that just has a go,” she added. It’s this quest to be innovative that led GYG to become the first global partner to trial food delivery via Google drones. Partnering with the team from Project Wing, a division of the X innovation lab run by Google’s parent company, Alphabet, the brand built a Drone Mothership, a custom kitchen onsite at test location, Royalla, on the border of NSW and ACT, and started sending burritos via drones to a group of testers. The work required Project Wing to provide a special package that kept the food hot and fresh during its flight on the autonomous drones. Based on its success, Thom said the next iteration expanding the trial into more homes is soon to launch. “We saw this as a true innovation and wanted to be in,” she said. “It came down to our ability to be super agile and desire to just run with it. No one doubts the brand, we just give it a go. And my role is just to cement that approach.